THERE HAS BEEN outrage from some quarters in the UK after a speech by European Council President Donald Tusk about Brexit. It was reported that he said there was a “special place in hell” for Brexiteers as he spoke about the importance of the Irish backstop and the Good Friday Agreement. He was speaking after talks in Brussels with our Taoiseach Leo Varadkar, who reportedly told Tusk “they’ll give you terrible trouble” after he had finished his address. 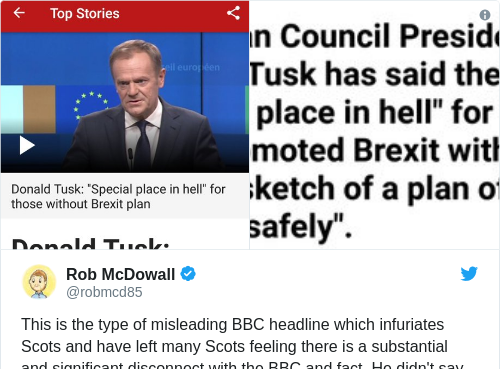 THE CLAIM: Donald Tusk said there was a special place in hell for Brexiteers. MP Sammy Wilson had a strong response to the news. He said Tusk had shown contempt for the 17.4 million people who voted to “escape the corruption of the EU and seek the paradise of a free and prosperous kingdom”. But others accused the BBC of using a “misleading headline” and failing to portray what Tusk had really said. Let’s have a look at the exact words Tusk used in his speech. Here is the text of his full speech, and we have watch footage of the live speech to confirm he kept to the script. “The top priority for us remains the issue of the border on the island of Ireland. And the guarantee to maintain the peace process in accordance with the Good Friday Agreement. There’s no room for speculation here. The EU itself is first and foremost a peace project. We will not gamble with peace or put a sell by date on reconciliation. And this is why we insist on the backstop. Give us a believeable guarantee for peace in Northern Ireland and the UK will leave the EU as a trusted friend. I hope that the UK government will present ideas that will both respect this point of view and, at the same time, command a stable and clear majority in the House of Commons. I strongly believe that a common solution is possible, and I will do everything in my power to find it. “A sense of responsibility also tells us to prepare for a possible fiasco. The Taoiseach and I have spoken about the necessary actions in case of no deal; I know that you will also be discussing this shortly with the European Commission. By the way, I’ve been wondering what the special place in hell looks like for those who promoted Brexit without even a sketch of a plan how to carry it [out] safely. Since the earlier deleted tweet, and the response to the story, the BBC has slightly changed its headline, adding the words “without a plan” to the end of it. Tusk at no point in his speech references the decision by UK voters in the referendum – he specifically refers to those who promoted Brexit without a plan on how to carry it out safely. While these people could, of course, be referred to as Brexiteers, it is clear he is not talking about every ordinary voter who was pro-Brexit. Voters would not be expected (by the European Council) to have a plan on how to carry out the proposals – it is well established that this is the job of politicians and in particular those in government. Email “FactCheck: Did Donald Tusk say there was a special place in hell for Brexiteers?”. Feedback on “FactCheck: Did Donald Tusk say there was a special place in hell for Brexiteers?”.